UConn Transportation Services recently contracted with Passio Technologies to provide GPS bus tracking and automatic passenger counting services on the Storrs campus. Passio Technologies collaborated with another industry leader, TransLoc, to provide HuskyGo patrons with the “Rider” mobile application, which is arguably the best in the industry. The implementation of these significant improvements, only four months after Mike Jednak, Associate Vice President of Facilities Operations, first promised them to student leaders, was the result of a strong team effort by professional from the departments of Information Technology Services, Parking & Transportation Services, and Purchasing. A group of frequent student riders recently joined with Transportation Services to test the Rider application. The feedback they provided was overwhelmingly positive and valuable. 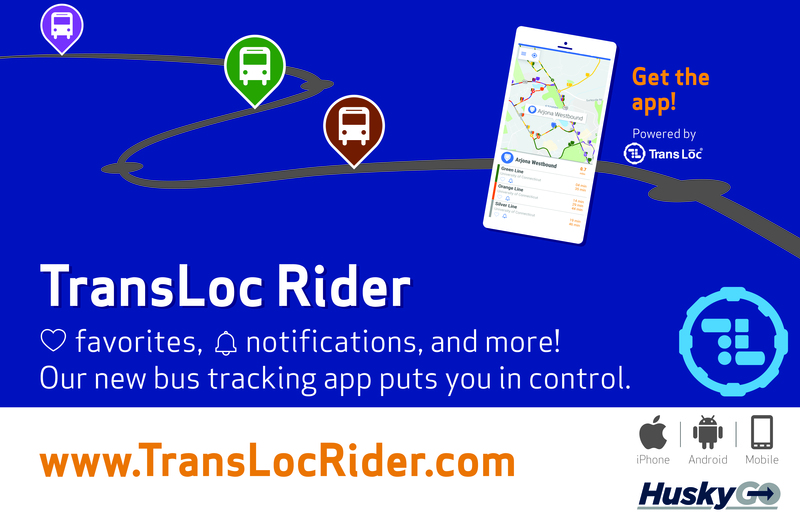 Download the TransLoc Rider app and get access to real-time travel information. The new tracking system will also allow UConn Transportation Services to collect and analyze ridership data in ways never before possible. Future changes to the University’s shuttle services will be based upon publicly shared data and analysis. The current shuttle tracking app (Ride Systems) will remain available for the remainder of the academic year, but its users are strongly encouraged to convert to TransLoc Rider as soon as possible.